Demanding immediate release of all these persons unconditionally and withdrawal of fabricated charges filed against them under the draconian Unlawful Activities Prevention Act (UAPA) , it also said that appropriate action should be taken against the guilty policemen as well involved in this act. Reports of these raids reveal that the police had no qualms in treating these persons – who are highly educated and have devoted larger part of their lives fighting for the marginalised and exploited upholding constitutional methods – as dreaded terrorists and also insulting their near and dear ones. The case of Prof Satyanarayan, Head of the Department of Cultural Studies and Dean of inter-disciplinary studies at the English and Foreign Languages University (EFLU) – a highly respected academic and scholar in his field and author of many books – reveals, how his house was also raided just because he happens to be son in law of Varavara Rao, a well-known Telugu poet and activist. Police had the gall to question his wife why (despite being a Brahmin) she has opted for intercaste marriage (with a Dalit) and why does not she puts sindoor on her forehead. The fast changing developments reveal this ill-conceived move has completely backfired and has led to tremendous outrage and uproar all over the country, with marches and rallies organised in different cities and towns joined by hundreds of people. Declaring that the unfolding situation in the country as worse than emergency, with a ‘republic of Hope’ turning into ‘republic of fear’ people have underlined that the present government has resorted to this move basically to deflect attention of the wider populace over its all round failure in managing the economy or addressing the issue of growing ruptures in social fabric or reining in vigilante gangs who have made a mockery of rule of law. It need to be noted that even the mainstream print media has also questioned the government for this ill thought move and charged that it is BJP’s Mckarthy moment reminding the people of the witch hunt by the US regime in late fourties and early fifties against writers, scholars and activists alleging left leanings. The unprecedented intervention by the highest courts of the country in this issue has played a key role in putting the government on the defensive. The Supreme Court created history of sorts when it allowed a third party intervention in this case responding to a petition filed by leading intellectuals and constituting a three member bench an issue a notice to the Maharashtra Police. Terming that ‘Dissent is safety valve of Democracy’ it has reminded the government that democracy would not be safe if the government quells dissent. As of now the focus of the case has shifted to the Supreme Courts, which will deliberate on the issue next week. It is crystal clear that the immediate trigger for this action on part of the Pune Police was the great expose by the Maharashtra ATS itself of a cache of arms, explosives and detonators from the houses of Hindutva zealots allegedly associated with the Sanatan Sanstha and related Hindutva groups, arrest of five activists and unearthing of a plot to further exacerbate communal tension by putting bombs at crowded places and festivals. In fact, these revelations had put added pressure on the government at the state level as well as the centre to ban the Sanatan Sanstha and its affiliated organisation Hindu Janjagruti Samiti. which openly talk of ‘Destruction of Evildoers as Spiritual Practice’. It should not be forgotten here that these outfits have been under the scanner of the investigating agencies for more than a decade, for their promotion of violent activities and even involvement of their associates in terror acts and earlier governments in the state had similarly sent its recommendations to the centre to ban these outfits. It is important to emphasise that this expose was possible because of investigations into the assassination of Gauri Lankesh ( Sept 2017) undertaken by Karnataka police which had revealed how people associated with these organisations were not only responsible for this particular killing but earlier assassinations of rationalists, scholars and left activists – namely Dr Narendra Dabholkar, Comrade Govind Pansare and Prof Kalburgi – which had rocked the nation The Maharashtra ATS is reported to be in possession of a hit list prepared by these terrorists of many scholars, activists, social workers who have always remained critical of the idea of Hindutva world view and have consistently opposed its proponents. The powers that be had also presumed that nationwide arrests – followed by a pliant media – would also help cover up their blatant failures on the economic front. In fact it is for everyone to see that the way in which the BJP dispensation led by Modi has bungled the economy has also become more and more apparent. Close on the heels of the controversy around Rafael deal which is being called a ‘Defence Scandal Larger than any thus far” and where “gross misuse of office and monumental criminal misconduct” (https://www.newsclick.in/rafale-defence-scandal-larger-any-thus-far) is evident has come the report released by Reserve Bank of India itself which has revealed that 99.3 per cent of the demonetised currency has returned to the bank which has vindicated what ex-Prime Minister Manmohan Singh had said on the floor of the house that the whole demonetisation exercise was ‘organised loot and legalised plunder”. Barring few cheerleaders of the present dispensation there is general consensus that within a span of one year the Modi government government has delivered ‘twin blow’ to the economy firstly through demonetisation and secondly through the ill-conceived Goods and Services Tax (GST), which have proved to be a complete disaster for our economy and broke the back of small businesses. Whatever might have been the claims of the present dispensation before assuming power, they have proved a disaster on the employment front also. While 2 crore jobs were promised to the youth, not even 2 lakh new jobs have been created till date. As the unfolding developments demonstrate governments calculations in this case have gone awry. 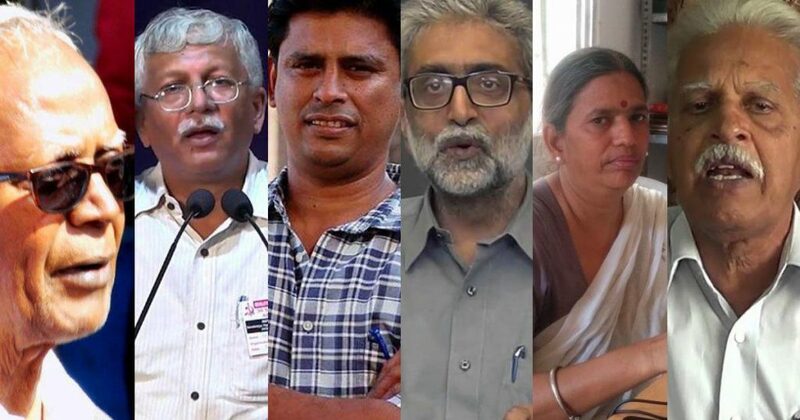 It had felt that with these arrests of leading human rights activists, renowned intellectuals it would be able to deflect people’s attention from its cosy approach towards these Hindutva terrorists and their deadly machinations. And as already discussed the government is finding itself on the backfoot on this issue. Equally troubling for the government has been the arrest of a person associated with Shiv Pratishthan, an organisation floated by Sambhaji Bhide, a fanatic Hindutva leader, in the arms haul case. It is the same organisation which is allged to be involved in the Bhima Koregaon violence against Dalits when they in their lakhs had taken out a massive procession to the Vijay Stambh situated at Koregaon near Pune to commemorate ‘victory of Dalits’ against the Peshwas two hundred years ago. A FIR filed immediately about the violence had directly blamed Sambhaji Bhide and another Hindutva zealot Milind Ekbote for this orchestrated violence. Prakash Ambedkar, grandson of Dr Ambedkar, who was a key speaker at the ‘Elgaar Parishad’ event held a day earlier in Pune to ‘celebrate this Dalit victory’ had also lodged a similar complaint against these zealots and asked the police to take up the cases under SC-ST Atrocity Prevention Act (1989). While the Maharashtra police has not even deemed it necessary to even interrogate Sambhaji Bhide – with Maharashtra CM Devendra Fadnavis giving him clean chit on the floor of the house – it seems to be hyper active in following a fabricated case by a Hindutva activist against these left leaning scholars, activists. We should not forget that these raids and arrests are in continuation of arrests of Sudhir Dhawale, Shoma Sen, Advocate Surendra Gadling, Mahesh Raut and Rona Wilson in June on allegations of ‘instigating the Bhima-Koregaon violence’ which was witnessed a day after the Elgaar Parishad and also being part of a ‘Rajiv Gandhi type assassination plot’ targeting PM Modi. Time and again two retired judges of the Supreme Courts, Judge P B Sawant and Justice Kolse Patil have underlined that they were the organisers of this Elgaar Parishad and the persons arrested earlier or in this round had no role to play in its organising the government wants to ‘prove’ that these persons were involved in it. The cavalier manner in which the government itself is investigating the alleged assassination plot is visible not only in the questions raised by the Delhi HC about the irregularities and lapses on part of Maharashtra Police when it was hearing the Habeas Corpus petition against the transit remand ordered by the CJM Saket Court in the context of Gautam Navlakha’s arrest but also the time gap of around three months in the two round of arrests. The story of this plot – supposedly targeting PM Modi – reminds one of the Gujarat of the first decade of the 21 st century, when similar plots were talk of the town, when Mr Modi happened to be chief minister of the state. It witnessed deaths of many a innocents in fake encounters on the specious claim that the particular ‘jihadi’ had come to assassinate Mr Modi. It is now history how many a police officers spent years in jail for their alleged role in these fake encounters. Today, the word ‘Jihadi’ has been replaced by ‘Urban Naxal’ – a new narrative which the government wants to build against its critics and dissenting voices. New Socialist Initiative is of the opinion that draconian laws like Unlawful Activities Prevention Act (UAPA) – which have been used in arresting these activists and which have earlier been used against thousands of activists and innocent persons – should not have any place in democracy. New Socialist Initiative has appealed to the people at large – citizens, residents of this country who still believe in democracy, secularism, equity, pluralism – to remain vigilant about the machinations of the powers that be at the centre, as survey after survey indicate that the BJP under Modi is fast losing its popularity, and it is possible that to remain in power in next elections it may resort to divisive agendas to polarise people.